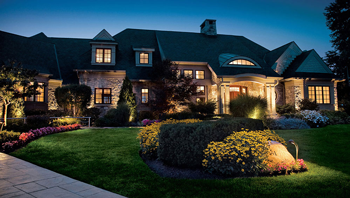 Creating a landscape lighting portrait for your home is more art than science. Your designer should work with you to highlight the most beautiful and striking features of your home and landscaping, all while promoting accessibility and safety. See what a difference inspired design makes for this home’s exterior. 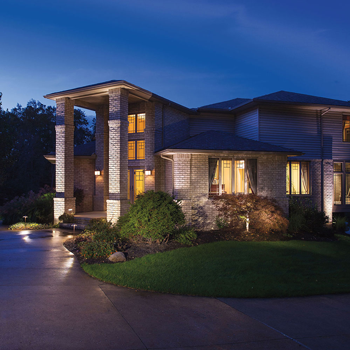 Light the way in your neighborhood with these stunning landscape lighting techniques for the front of your home. 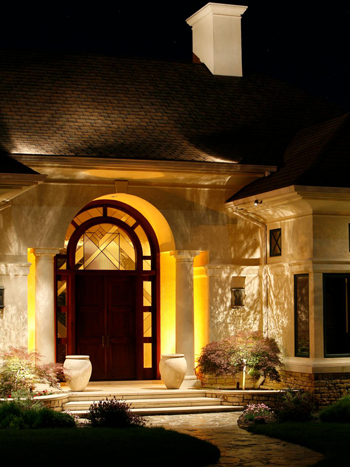 To display your home’s exterior to best advantage, add depth and variety to your lighting choices. Illuminating just the house can look eerie and out of place. 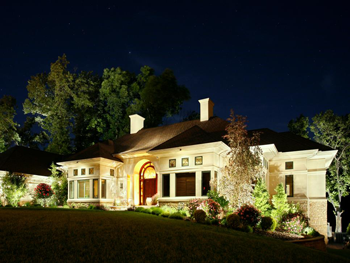 Showcase your landscape architecture with path lights and spot lights. This dramatic lighting choice highlights the entryway to great effect. Mitchell of NiteLiters chose to backlight the pillars instead of spotlight them. “It creates depth and leads your eye past the pillars to what’s behind them,” he says. Shadow can be just as interesting as light. Compare the cheerfully lit front door with the intricate shadows from this large tree. 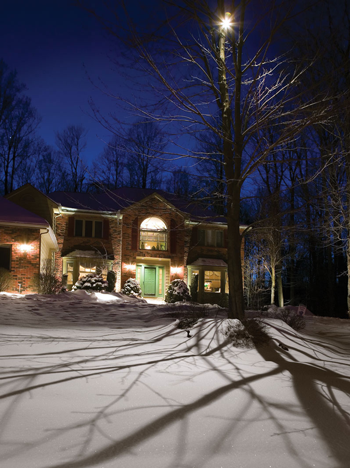 Instead of a bare yard during winter, the lighting showcases beautiful tree branches. The effect was created with downlighting, and you can see the spotlight placed on the top bough. This house is lit with both up and down lights to illuminate the front from foundation to chimney-tops. This silhouette creates a unique effect, since most homeowners don’t light their home’s roof. To add depth, the trees in the backyard are also lit. Layering your lighting outdoors creates depth and subtle beauty to your home. Lanterns flank the doorway, with step lights in the columns and path lights on the front walk. A clear and safe path is revealed without being overwhelming. And notice the accent lights highlight the beauty of the brickwork. Are you ready to put your home in the spotlight? Give us a call, and we will create your landscape lighting portrait.